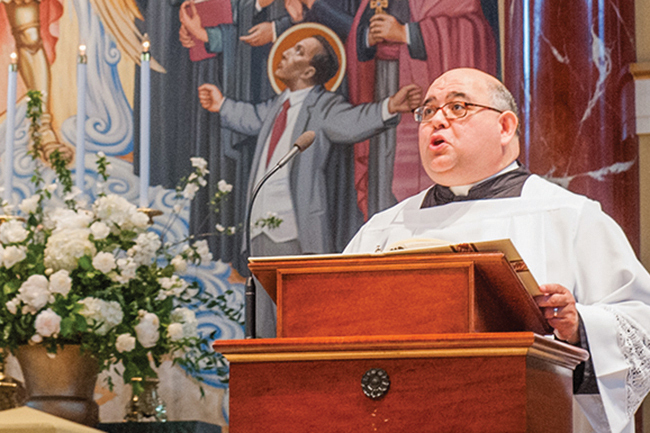 Michael Podrebarac is the archdiocesan consultant for the liturgy office. Now that we’ve completed the observance of the centenary of the apparitions of the Blessed Virgin Mary at Fatima in Portugal, what’s next? In other words, was it just a big celebration, packed with Masses, inspirational presentations and public recitations of the rosary? Or is it something more — something that might lead us to make a real difference in our lives? Anniversaries are easy. But living in a relationship for another year, and beyond, requires renewed faith, realistic determination and reserves of grace. And, of course, we have at our disposal the means to live more deeply our life-giving relationship with Jesus and with his mother: the daily recitation of the rosary. The essentials of our faith are straightforward. We believe in Jesus Christ, born of the Virgin Mary, whose consent to become the mother of Our Lord and God makes eternal life possible. To renew that faith, we simply need to acknowledge it as something that not only took place long ago but that also continues to have meaning today. Successful determination is built upon a realistic foundation. Most of us know how to “say” the rosary, but the goal is to truly “pray” it so that it makes a real impact on our lives. This won’t likely happen overnight, but is a gradual process. Practice makes perfect. And practice toward perfection requires grace — that is, God’s divine life in us. And grace isn’t cheap, even though it’s free. It’s something we need to cooperate with and make use of, and sometimes certain resources can assist us. That’s the goal of a resource the archdiocesan liturgy office is presently preparing — to assist us in learning to pray the rosary with greater clarity and meaning, that what it offers us may be more readily imitated in daily life, so we may obtain all that it promises for us, especially a deeper relationship with the Lord Jesus. “Praying with the rosary” will incorporate different forms of guided meditations upon the mysteries of the life of Jesus — this is key to unlocking this devotion’s potential. Included for each mystery will be an opening meditation, short Scripture verses, quotes from the saints and full-color artwork to guide us in entering the scene and seeing the life of Christ anew. Look for this free and easy-to-use resource on the webpage of the office for liturgy and sacramental life in time for Lent. And contact the liturgy office for your own free, printed copy. The more we know about the Lord Jesus himself, the more we learn about his mother Mary. And the closer we grow to Mary, the closer we’ll be to him. Her maternal counsel through the rosary is trustworthy: “Do whatever he tells you” (Jn 2:5). Please send me a free printed copy of the easy to use resource mentioned in this story.